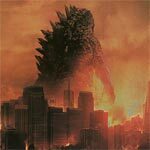 Sony Pictures Home Entertainment has announced the date and released artwork for the sci-fi actioner, Godzilla (1998) starring Matthew Broderick and Jean Reno. Click on the link below or image to the left to check out the features and artwork. From Dean Devlin and Roland Emmerich, the men who blew up the White House and destroyed every known landmark around the world in ID4 (and subsequently 2012) comes the 1998 monster-adventure that have split audience goers from being a totally awesome popcorn flick to one that completely raped their views on the big green creature. While I could care less how this compares to the Japanese versions, Godzilla has its own problems without making those comparisons.